When Tercio and Thiago Borba first visited the Caparaó Region of Brazil four years ago, they noticed the collective lack of support farming families had to achieve consistent coffee quality. “We felt that we had to find a better way for these producers to have free access to knowledge so there would be a legacy for producing families and their region,” says Tercio of 3Brothers Coffee, an importer of Brazilian specialty coffee. Brazil’s three highest mountains surround the Caparaó region, which is predominantly made up of small landholder farms at altitudes of up to 1550 metres above sea level. The management and harvest of coffee is still done in a very rustic manner, without the use of mechanised methods. Despite understanding its potential and high return, Tercio says the production of high quality coffees is something new to Caparaó producers. To spread the awareness even further, for the past four years 3Brothers, along with local partners, has been working with Caparaó producers to improve crop production and practices, provide necessary training, and encouragement to help change the face of Brazilian specialty coffee production. In Tercio’s words, “we are doing it”. 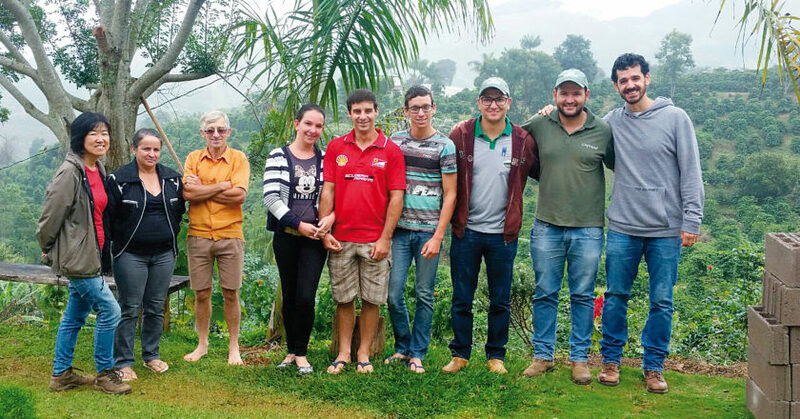 3Brothers is helping make an impact thanks to its partnering with Caparaó Júnior, a non-profit junior company that’s part of the graduation course of Coffee Agriculture at the Federal Institute of Espírito Santo (IFES). A board of professionals supervise the company, which is composed of students and graduates who provide a range of services to coffee producers, all free of charge. The project teaches producers about crop management control, best harvesting and post-harvesting practices, and brings agronomists into producing fields to conduct lab tests and issue reports on what needs to be done to improve crop production. Consulting practices with producers also includes planning of business cycles, analysis of business opportunities, environmental impact assessment, research and experiments, financial planning, data collection, pest and disease management, and economic feasibility projects, just to name a few. In partnership with Caparaó Coffee, Burgeon Specialty Coffee, and Cecília Nakao, 3Brothers has committed to offering producers an array of complementary services. As a result, Tercio says he has witnessed increased associations between producers, and greater attendance in workshop courses held throughout the year. Tercio says the provided activities and results have been so positive that it creates an incredible domino effect on neighbouring farming communities. This results in increased volumes of quality at a much higher premium, directly benefiting those families. The backbone of this project is a commitment Thiago, Tercio, and their partners want to project to the Brazilian specialty coffee community: to believe in human potential, to treat people with maturity and respect, and to provide them with the light of knowledge, and tools. To date, 3Brothers’ partnership with Caparaó Júnior has aided more than 26 producers, and is growing. “We believe the services we provide will improve the quality of life for farming families and impact others to make positive changes,” Tercio says.